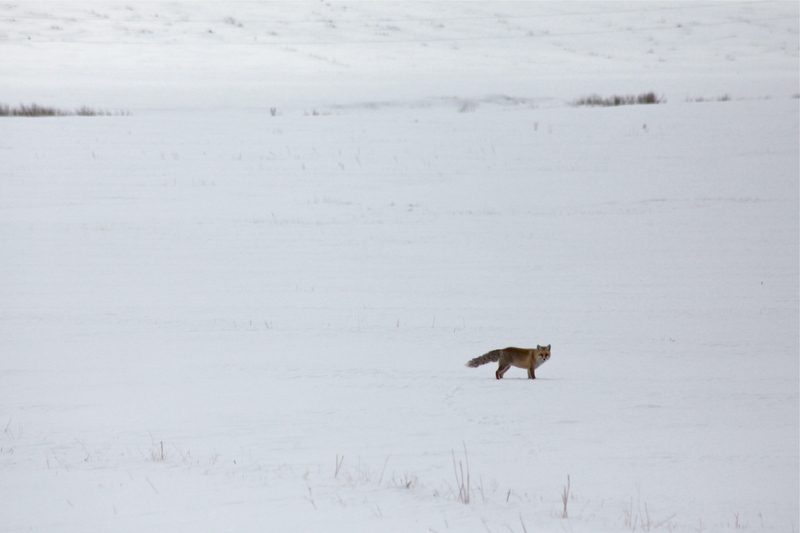 Cagan Sekercioglu: "We have no choice but to be optimistic"
A red fox in the snowbound fields close to the Sarikamis Forest near Kars. I’ve just written a story for the Christian Science Monitor (not out yet) about the creation of Turkey’s first ever ‘wildlife corridor’, a hugely significant conservation project for the country. It will link the isolated Sarikamis Forest near Kars with larger forests in the Caucasus and Black Sea region. I sent some questions to Cagan Sekercioglu, a conservation biologist at the University of Utah and founder of KuzeyDoga, the wildlife NGO that has been the driving force behind the corridor. Having exchanged emails with Dr Sekercioglu in the past, I had a hunch his answers would be fairly comprehensive. In fact he sent a 2000+ word response that is more than double the length of the article I was writing. It’s fascinating for anyone who is interested in these issues, so I’m posting it in full. How will the creation of this corridor aid the survival of wildlife in the region? Turkey’s first wildlife corridor is the biggest landscape-scale active conservation project ever undertaken in the country. By active, I mean the creation of new habitat and habitat linkages through reforestation. There are some national parks in Turkey that are bigger in area, but they were existing habitats that were simply declared protected rather than extensive new habitat being created and linked. The area of the corridor, 23,500 hectares, is bigger than the 22,900 hectare Sarikamis-Allahuekber National Park it is connecting! This is very rare in global corridor projects. In fact, the wildlife corridor, whose status is “Protected Forest”, was a national park, it would be Turkey’s 15th (out of 40) biggest national park. A third of this area will be protected by the Ministry of Forestry and Water Works. By connecting the isolated Sarikamis-Allahuekber National Park and other isolated forest fragments to the extensive Black Sea-Caucasus forests, not only will the corridor link the isolated populations of mammals, especially large carnivores such as wolves, brown bears, and lynx that require very large areas, but it will also provide additional habitat through reforestation. Does its creation have a broader significance for the Turkish environmental movement? It has great significance. The Turkish environmental movement has to mature into a constructive, creative movement, with an emphasis on solutions. This is very difficult to do in the current, anti-environmental, make-money-at-all-costs atmosphere in Turkey. However, we need to do this in order to move beyond a movement whose general public perception is anti-everything. We need to propose solutions and make use of conservation opportunities that can inspire the general public and the decision-makers. Our focus as KuzeyDoga is regional, landscape-scale conservation. In Lake Kuyucuk of Kars, we created Turkey’s first bird nesting island in 2009, by convincing the former Kars governor to provide us with trucks, bulldozers and excavators so that we could convert the old road bisecting the lake into an island. We finished in only 2 months and the approximately 1 hectare island we created was colonized by breeding birds within a week. In fall 2011, we counted more than 200 breeding and roosting sites on it, as it is a safe haven from cattle and sheep that graze the shoreline of the lake, as well as from dogs, foxes, and people. Turkey’s first island created for conservation inspired other Turkish conservationists to imagine similar projects and I know of at least two other conservation island projects that have been proposed as a result. Turkey’s first wildlife corridor is the next step in our landscape conservation vision. We believe and hope that it will inspire other conservationists to propose more wildlife corridors, so that we can cover Turkey in a corridor network. What inspired you to create Kuzeydoga? I am an ecologist, ornithologist, and conservation biologist. My long-term work in northeastern (kuzeydogu) Turkey was inspired by a 2001 Harvard-Stanford-St Petersburg butterfly expedition during which we found 7 cryptic species new to science, even thought Turkish butterflies were thought to be pretty well-known. I fell in love with eastern Turkey, which had always fascinated me, and I vowed to come back. In 2003, I decided to start working in Kars, as it is located on a major bird migration flyway, but there was no bird banding or systematic bird monitoring in eastern Turkey. Initially, most of the work was supported by Christensen Fund of California, whose office was located a 10 minute bike ride from my office at Stanford University. After a pilot bird banding season in Kars, I found the perfect location for eastern Turkey’s first bird banding station in the wetlands of the Aras River near Yukari Ciyrikli village, Tuzluca, Igdir. Soon, I realized the need for community-based conservation, ecological research and biodiversity monitoring in all the “Serhat” provinces of Kars, Igdir, Ardahan and Agri and filed the application to found KuzeyDoga in fall 2007. In time, our projects expanded to other groups besides birds, especially keystone mammal species such as wolves, bears and lynx. Was there any particular moment when you realized the seriousness of the threat facing Turkish biodiversity? It was a gradual process but the 2001 butterfly expedition was probably the turning point. We had detailed information on the good locations for the group of butterflies we were looking for, mostly from a detailed book published in 1995. However, about half of the good localities were gone, as key butterfly food plants were grazed away, mostly by sheep. Considering that we found at least (research still ongoing) seven butterfly species new to science in the other localities, I realized that some unknown butterfly species of Turkey may have been only living at the destroyed localities, and may have gone extinct in the past a few years, before ever being discovered. That was a horrifying thought. Why is it that environmental issues garner so little interest in Turkey? Part of it is the mistaken belief that environmental issues do not have direct relevance to the daily lives of people, many of whom are focused on survival. However, with increasing education, outreach and environmental stories, as well as people’s own experience, people are starting to realize that environmental health equals human health. The other problem is, like people in general, most people in Turkey have very short-time horizons and short attention spans, and mostly worry about the next week or next month. There is also a fatalistic aspect, embodied in our saying “After I am gone, I don’t care if Noah’s flood destroys the world”. I also think the fact that Turkey did not go through the Enlightenment and the Romantic periods is a factor. A lot of the interest in natural history and environment in Europe and related cultures originated during and after the Renaissance, helped by the myriad new species brought back to Europe from the colonies, which Turkey did not have. Therefore, natural history, natural history museums, and related hobbies such as birdwatching are not part of the culture in Turkey as they are in places like the UK, Holland, Sweden, Germany etc. If the general public is not interested in biodiversity, has little access to good natural history information, and does not know about Turkey’s rich natural heritage, then they will not prioritize conserving it. How are you trying to change that? Environmental education, communication, and public outreach are critical. That’s why KuzeyDoga works hard to communicate its findings and the importance of Turkey’s biodiversity constantly. We also work very hard to constantly do public outreach and communication, especially with the local newspapers and journalists in the region. We probably average one different news story and/or press release every week and some of these stories end up in a dozen papers. It is critical to inform the public and we also use social media very effectively, including Facebook, Twitter, blogs and our website, www.kuzeydoga.org. What are the shortcomings of the Turkish environmental movement? funding, not achieving meaningful conservation. Another problem is that conservation and environment in Turkey are often extremely politicized, often as a “leftist” cause and lumped with other “leftist” causes. That makes no sense because everybody wants to live in a healthy environment. Is there anything more “nationalistic” then wanting to protect and conserve Turkey’s beautiful landscapes, habitats and biodiversity for future generations? To paraphrase a speaker in the Sundance documentary “A Fierce Green Fire” on the history of the environmental movement, “There is no socialist air, there is no Islamist air, there is no nationalist air, there is air. And if you breathe air, that makes you part of the environment and if you are concerned about clean air, I would consider you an environmentalist!”. You can say the same thing about water, soil, forests, and biodiversity. Turkey’s environmentalists need to communicate the message that every human being, regardless of political leanings, deserves to live in a healthy environment. It is a basic human right. What is Kuzeydoga trying to do differently? We are one of most active locally-based environmental NGOs, many of which are located in big cities in Turkey. First, we are located at the heart of our work, in the small city of Kars, within 30-60 minutes drive of most of our key sites (the farthest are 2 hours away). We are not stuck in a big city like Izmir or Ankara, where you are away from a lot of the conservation action and you cannot respond as fast. In Istanbul, sometimes even driving home from work takes over 2 hours! But we can get out of Kars in literally under 5 minutes, which means we can spend a lot more time focused on both biodiversity research and locally-based conservation and do not have to fly to places to do our conservation work. Our ability to get out of the city and access the beautiful places we are trying to save is also a constant source of inspiration and daily reminder of the real places, organisms, and local people we are working for. Because we spend a lot of time in the field and in villages, we have very strong relationships with local people and have a lot of credibility with them because we do not come a few times a year, tell them what to do and go back to the big city. We live in Kars and Igdir just like they do, and after seeing us constantly working at Kuyucuk lake, Aras wetlands and Sarikamis forests, and other field sites, we slowly gain their respect and support. This has also helped change the minds of many people who used to think we had ulterior motives like money. The creation of the wildlife is a positive step by the Turkish government. Is their attitude becoming more enlightened? Does it give grounds for wider optimism? Sadly, I do not think so, if the 2012 Yale Environmental Performance Index is any indication. Turkey dropped substantially, from 77th place among 163 countries in 2010 to 109th place among 132 countries in 2012. Even worse, in biodiversity and habitat conservation, we are now behind all but 11 countries, ranking in the lowest 8% of them, countries like Eritrea, Haiti, Moldovia, Libya and Iraq. That being said, there is increasing realization of the importance of conservation, and the government’s support for KuzeyDoga’s conservation firsts, such as Turkey’s first bird nesting island in Lake Kuyucuk and Turkey’s first wildlife corridor gives me hope. It is like turning around a very big ship. It will happen slowly but we have to keep pushing. I have to keep thinking about how USA and European countries dealt with similar problems but slowly turned things around. At the Sundance Festival in Utah this year, I watched the documentary “A Fierce Green Fire”, the history of the environmental movement. Dam building in the USA in the 1950s was done in a similar mindset to Turkey now, but environmentalists kept fighting and changed things. Let’s hope we can change things faster in Turkey because we do not have the luxury of another 50 years. The next decade will be very critical for the future of biodiversity in Turkey. We have no choice but to be optimistic. I agree with Cağan except one thing, that is environmental projects always employ one or two qualified staff (mostly biologists) to handle the work on site. That person(s) involve the support and participation of the locals at almost every imaginable level, including providing part-time works for them and finally turkish/foreign volunteers work in the projects. I am a member of underwater research society monk seal research group, this is how we work, and how DHKD works as far as I have closely witnessed. After all the terrible news–the HES projects, the ongoing quest for the new canals–this little bit of news came as big relief.